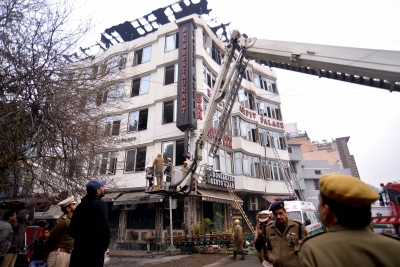 New Delhi, Feb 13 (IANS) A day after a hotel in Karol Bagh, here, was gutted by fire, it was business as usual for the hotel staff in the area who greeted gaily, but not without a smidgen of disbelief that made itself apparent at the very mention of the terrible tragedy. The soot-smeared ghost of Arpit Palace Hotel was an object of curiosity for the passers-by. They stopped to gawk at the building, and felt sorry for those who perished in the early Tuesday morning fire, the worst such in 22 years. Those who could escape the tragedy returned on Wednesday to collect their belongings from the locked down hotel, which was guarded by three-four constables. One of those who came back was Ishaan, a 25-year-old man studying in Delhi, who lost his mother in the tragedy. Ishaan came to collect his mother's belongings with H. R. Shah, his mother's colleague, who too was staying at the hotel, but in a different room. Unlike Rubia Jusafbhai, Shah was lucky to escape the fire. Shah told IANS they will perform Rubia's last rites at Nizamuddin later in the day. The staff in nearby hotels -- the centrally-located area houses around 200 hotels -- greeted guests with a practised charm, but calmmed up at the mention of the fire. Though they insisted there has been no significant dip in the business, nor cancellations, expressions of concern on their faces were discernible. "Few of my guests cancelled bookings today. I cannot ask them why they did it -- the reason is obvious. It's bad for business. It shouldn't happen to anyone," owner of Hotel Metro View, located just few yards away from the ill-fated Hotel Arpit Palace, told IANS. He refused to share his name, but emphasised none of the hotels in the vicinity were engaged in any illegal activity. However, he worried about "people having this attitude as if we are rogues." A number of Hotel Arpit Palace evacuees took shelter in his hotel. "I offered them tea, coffee, let them use the bathrooms. I did whatever I could," he said. He said crucial time was lost in the rescue work because of the police barricade, which blocked the entry to Gurudwara Road -- where the hotel was located -- from Pusa Road. Due to the barricade, fire tenders had to take U-turn from Pusa Road to reach the Jhandewalan roundabout, from where they took the Arya Samaj Road to come back to the Gurudwara Road -- a journey that must have taken more than 10 precious minutes. Screams from the blazing hotel shattered the silence of the night, recalled a theatre artiste from Assam who was staying in the nearby Hotel Mid Town. "I was woken up by the screams. It was terrifying. When we went outside to see it was only smoke in the lane. Then I heard a loud blast, must have been a boiler or something. We were so scared that we wanted to leave at night only and packed our bags," said Kismat from Guwahati who had come with her group to perform at the National School of Drama. In the beginning, there was a lot of smoke coming out of the building and the scream of a man shouting for help, she recalled. "Suddenly the fire accentuated and the man panicked and jumped from the fourth floor of the hotel to his death," she said. Suresh Kumar, a 45-year-old IRS officer, jumped to his death on the day of his marriage anniversary. He was one of the 17 victims of the fire. The blaze was second worst since the 1997 Uphaar cinema hall fire, in which 59 people were asphyxiated to death during the showing of 'Border'.